Probably (though not certainly) the earliest full treatment of a trip to Mars in the movies was the Danish epic Himmleskibet (“Heaven Ship”), from 1918. A bunch of virile-looking Danes in cool jackets make the hop from Terra Firma to the Red Planet in their spaceship Excelsior. There they find a race of insufferably well-behaved, virtuous people in robes and draped gowns, led by a benign Wise Man, who have overcome war and violence, and are also vegetarian. Within minutes, it need hardly be said, the Earthmen have shot a bird, and set off a grenade. You’d think they were ‘muricans, not Danes. Still, the crew is chastened at how nice things are on Mars compared to how effed-up things are on Earth, where people drink, smoke and gamble. The leader of the Earthmen falls in love with the Wise Man’s daughter, who agrees to return to Earth with him. At first the Wise Man is horrified at the thought of his kid going to planet “thousands of years behind” hers, but eventually he accepts it, saying: “Go my child. I am also planning a long journey – the last one! I feel that my life is fulfilled now and I am ready for the happiness of death!” So apparently, for all their utopian advancement, the Martians haven’t lost the art of the parental guilt trip. A few years after Himmelskibet came Yakov Protazanov’s 1924 voyage Aelita, adapted from an Alexei Tolstoy novel. A young Soviet comrade makes the trip and meets the titular Queen, who picks the handsome comrade over her ruling class background when he foments Martian revolution. The movie is about half gushy melodrama, half Bolshy propaganda. It’s worth seeing for the angular avant-garde production designs of Alexandra Exter. 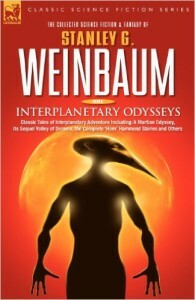 This sentient bird-like creature is rescued by the crashed Earth explorer and becomes his loyal friend in A Martian Odyssey, the highly influential yarn by Stanley G. Weinbaum first published in 1934. 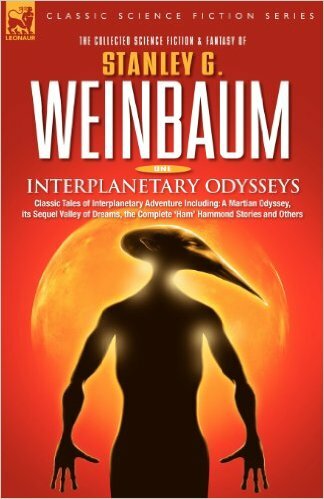 The story concerns the journey the two make, on foot, across the Martian desert trying to get back to the Earth outpost, and their encounters with various less amicable Martian life forms. Tweel is often noted for being the first alien in sci-fi who, in the words of editor John W. Campbell, “thinks as well as a man, or better than a man, but not like a man.” But likable as Tweel is, it should be noted that the Martians in War of the Worlds think pretty well, and they aren’t exactly the folks next door. Dead, maybe, but not done with us. In Quatermass and the Pit, known in the U.S. as Five Million Years to Earth, an ancient spaceship is accidentally excavated in London during an extension of the Tube, and is found to be full of deceased insectoid Martians. Meddling awakens the terrible psychic power of the creatures, and terror and destruction ensue. At the climax, a glowing Martian presence glowers down on the city, and is confronted by hero James Donald on a crane. Adapted from a BBC show and directed by Roy Ward Baker, this moody, unnerving tale is arguably the single best movie ever made by Hammer Studios. Intelligent dialogue and bluff, invigorating performances by Donald, Andrew Kier as Quatermass and Barbara Shelley at her most chic keep things lively, and even the clunky special effects in a vision of the good old days back on Mars doesn’t really mar the movie’s convincing feel.